Home›Latest News›Water Quality›PEQ update: What went in? Readers had plenty of questions about some specially installed equipment in a previous story – here we give you the answers. In the Spring edition of Plumbing Connection, one story that created wide interest was our review of the Post Entry Quarantine (PEQ) facility at Mickleham, on the outskirts of Melbourne. The job required special skills, care and attention and the Department of Agriculture and Water Resources (the client) provided a Third Party Assessor (TPA) to review and inspect the project throughout the process, to ensure strict compliance was in place. What we didn’t have room for in our previous story was further detail about some of the plumbing equipment that Geschke Plumbing Contractors had to specially source and install. 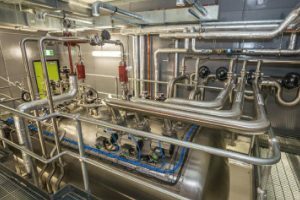 For Geschke, the task at hand was to supply and install the hydraulic water, gas and fire main services for site infrastructure, the avian facility’s decontamination systems and other buildings that would later house dogs, cats and ruminants (e.g. cattle, sheep, goats, etc). Geschke worked with local plumbing merchants Bentons Plumbing Supplies for the delivery of more than 7km of HDPE fire water and reclaimed water mains. These piping systems were installed using Geschke’s own accredited plumbing installation tradesmen and quality assurance system. Ground conditions were challenging and the approximately 2.5km of sewer infrastructure was installed mainly through solid rock at depths of up to 4m. You won’t find a quarantine facility on every street corner but Geschke researched and found a few specialist supply companies around the world that could meet the requirements for such avian facilities. Geschke contracted Suncombe Limited from Middlesex, England, which worked in conjunction with Fineweld Stainless Steel from Carrum Downs, Victoria to design, fabricate, test, install and commission the decontamination plant for the avian facility. Fineweld was also contracted to supply and install the stainless steel containment piping systems to the five avian areas as well as connections to the decontamination plant. The success of the installation was due to the close working team, commencing with the precise specification, delivery and commissioning. 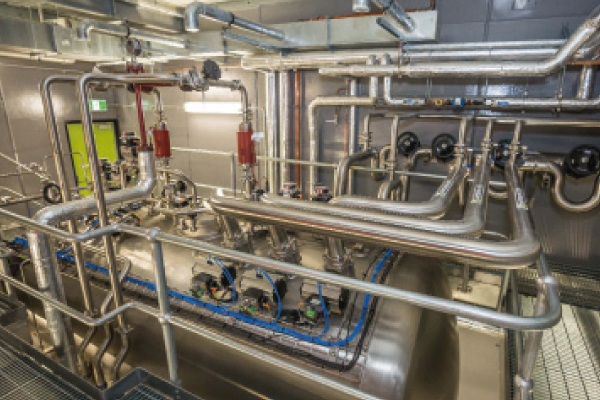 Geschke Plumbing Contractors and Pump and Electrical Services supplied and installed two sophisticated hot water systems servicing the five separate zones independently, with serious backflow prevention requirements to protect the water systems. Geschke managing director John Geschke says, “The teamwork involved on such a complex project was testament to all parties involved on the project. And considering the responsibility of protecting our native fauna and flora, it was worth going the extra mile”.